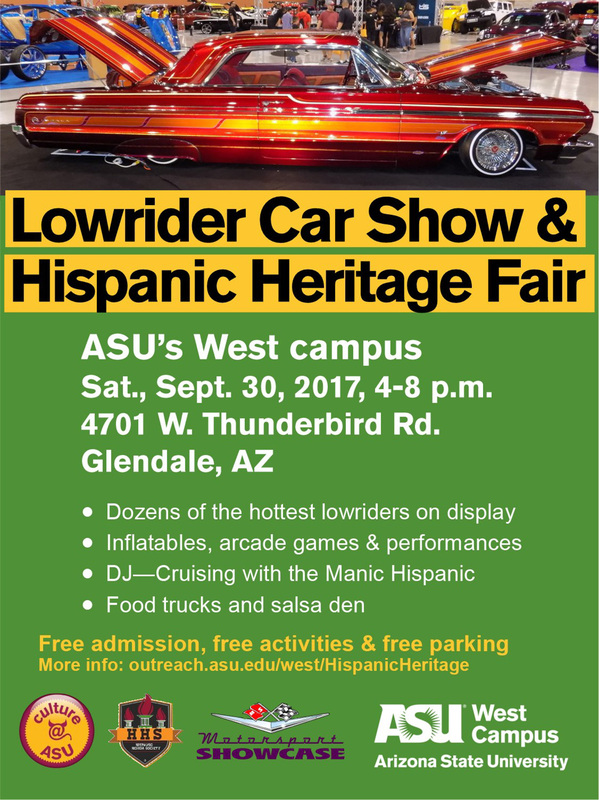 Last Event: Saturday Sept. 30 4 p.m. - 8 p.m.
See dozens of the hottest lowriders on display, enjoy inflatables, arcade games and performances. Music and entertainment provided by DJ "Cruising with the Manic Hispanic." A "¡Salsa-Salsa Fiesta!" den offers a relaxing, cool-off area and food trucks will be on hand: Yellowman Fry-Bread and Ni De Aqui Ni De Alla. This event is hosted by Arizona State University's Office of Government and Community Engagement and the Hispanic Honor Society at ASU West. The event will be held on the Quad lawn out front of the Sun Devil Fitness Complex. Free admission, free activities and free parking! For more Hispanic Heritage Month events at ASU's West campus, go here!